Last weekend we visited the UK to attend the Bridlington Trade & Custom Show, jointly hosted by VFM, BSRA and the LCGB. They were kind enough to let us have a display-only stand on the ground floor and we pulled out all stops to ensure that there was some tasty stuff on show for the paying public. Several of the RLC crew attended and we were joined by the lads from JB Tuning, the main UK importers for the Casa Performance range of parts. 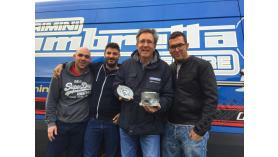 Also on the stand was Casa Lambretta head man Vittorio Tessera, Italian tuning genius Roberto Barone and living legend Tony Tessier, who was there promoting the forthcoming record-attempt Lambretta Streamliner project. Parts on display included the main elements of the Casa Performance range including the CasaCase engine casings, the various SS kits including the all-new SSR250 kit, exhausts, brakes and lots, lots more. Scooter wise we brought over the original Innocenti Lambretta 125cc Streamliner courtesy of the Panini family, a factory Model C racer , Luca Zani’s SS200 race scooter that won the 2016 BSSO Group 6 Championship and the RLC shop test-scooter fitted with a SSR250 kit. This was fired up after the show and several people had the chance to take it for a spin. Team SRP’s Stuart Days’ comment was, “it’s incredible – my hands are still shaking!” after trying it out. The show was packed solid and the atmosphere both inside and outside the event was electric. The quality of scooters on display was breath-taking and a real testament to how healthy the British scooter scene currently is. The Casa / RLC stand was literally mobbed ALL day – from start to finish - and judging by peoples curious faces and the untold questions, it was all a storming success as people bring themselves up to speed on what’s about to come out onto the market! The day for us was topped off when RLC customer Tim Craig of Whitby (pictured) won two prizes in the Custom Show for his TV200 we restored! Thanks to everyone who came over to say hello and a heart-felt thankyou to the organisers for allowing us to participate!